The study analyzed SSI rates for 30,493 procedures from before and after the new operating room attire guidelines were implemented at one institution. The guidelines stipulate, “surgical costumes are designed for maximum skin and hair coverage” (see §416.44(a)(3) and §416.51, concerning infection control). These guidelines are currently recommended by the Centers for Medicare and Medicaid Services (CMS). Costs associated with the new attire guidelines demonstrated an increase in the cost per person to enter the operating room from “10- to 20-fold,” going from $0.07 – $0.12 per person to $1.11 – $1.38 per person. The sharp increase in cost per person is largely a result of long-sleeved jackets, which the study indicated were mandated by AORN attire guidelines, the cost of which is ~ $1.04 per jacket. For these jackets alone, the cost for the institution in this study was estimated at $1,128,078, which includes the cost of disposal estimated at ~$0.08 per jacket. The continuing debate over operating room attire. Predictably, this study elicited response from AORN representatives. This defense of the AORN guidelines is largely semantic, however, since a surgical skullcap clearly does not meet the guidelines’ requirements for “covering the nape of the neck.” So, while the AORN guidelines do not explicitly ban “skullcaps” from surgical operating rooms, the guidelines do prohibit the use of surgical headwear that fails to meet this guideline. While this back and forth between AORN, the authors of the study, and the surgical community may seem like a lot of quibbling over nothing, there are real world implications for this debate, especially considering the fact that AORN’s guidelines are recommended by CMS. When a hospital’s funding pivots on their meeting CMS and accreditation guidelines, the guidelines should be considered deeply, and based in evidence, as they have the ability to impact funding, patient access to care, and the cost thereof. Questions remain re: operating room attire and quality. Ultimately, all parties invested in this discussion are focused on the same goal: delivering the highest quality care. Towards the accomplishment of that goal, many questions remain. What attire actually does result in the safest surgical atmosphere for patients, if the guidelines do not make this explicitly clear? If not skullcaps or bouffant caps, what head wear ensures the lowest risk for SSIs? Who will ultimately foot the bill for what costs are accrued by changing attire guidelines and regulations? The study alleged that ONE institution spent more than $1 million in an effort to meet the AORN/CMS regulations. What next steps will be taken to better understand the relationship between surgical attire, SSI rates, and patient safety more generally? It is clear that more research needs to be conducted in this area. What further study would result in the most robust data with which new guidelines can be crafted and implemented at health care institutions? What’s clear is that there is room to improve the SSI rates at health care institutions and surgical centers. It is also clear that all parties are invested to ensure patient safety and provide clean, hygienic spaces for the delivery of care. Hopefully, this common ground and these common goals will allow all invested parties to work together towards a solution that ensures quality care while having the least possible impact on medical costs and access to care, which are already a concern for many individuals, hospitals, and other stakeholders. It is absolutely critical that any and all medical guidelines are founded in evidence over preference, quality over convenience, and filtered through the lens of urgency that medical treatment dictates. 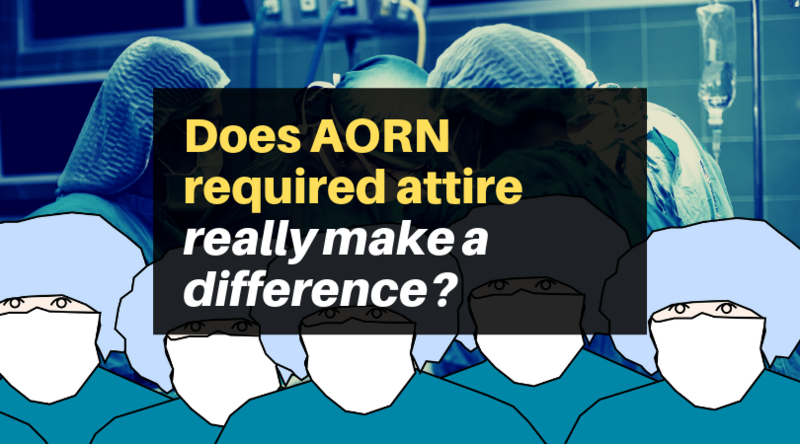 What do YOU think about AORN’s OR attire guidelines? Does your cath lab follow them? Leave a comment, below! Searching for advice or answers? Ask an Alliance of Cardiovascular Professionals member! Our CONNETWORK program connects members with like-minded colleagues and experts to crowd-source answers to the important questions you face every day. We do follow AORN guidelines and our Cath Lab is now located behind the red line! The AORN made their recommendations without any scientific evidence. The scientific evidence that has been collected since then shows they are wrong — not only by the lack of evidence to support their push, but evidence that even shows they are backwards in their recommendation.